There are a few twists in this classic Portuguese fast food sandwich. 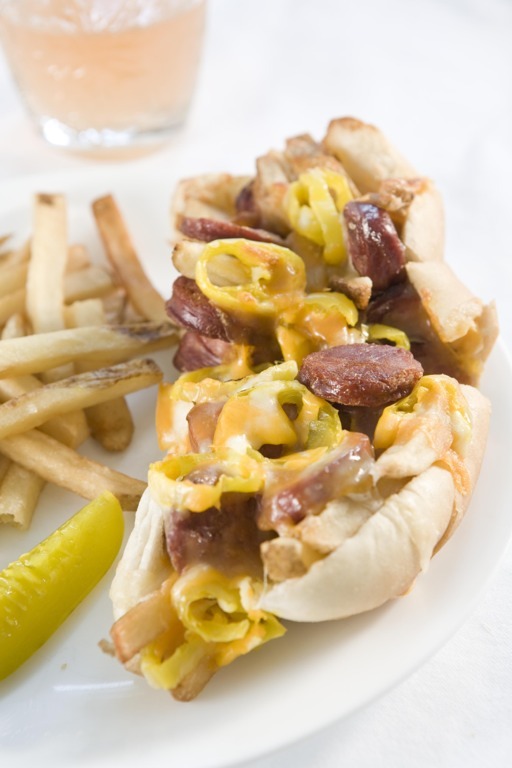 Check out the recipe below for chourico & chips sandwich, including grilled bread and hot pepper rings. There aren't many recipes this easy. If there is one trick to preparing a João Grande perfectly, it's timing! Try to have everything ready at relatively the same time. Keep that in mind when you're preparing the components! Frozen french fries (enough to fill the desired number of rolls and some extra for sides). Ready your fries for cooking. If you fry them (better-tasting) have your frying rig ready and hot. If you're baking them (healthier), preheat your oven. Time your fries to be ready just after the chourico and rolls are done. Place two large skillets over medium heat. In skillet number one, add your olive oil. When the oil begins to shimmer add the chourico and cook, stirring occasionally. While the chourico is cooking. Butter the inside surfaces of the rolls and place them one at a time (buttered side down) on the second skillet grill until they are well toasted. You may want to use a small plate to push them down a bit on the hot skillet surface. Continue cooking the chourico stirring occasionally until the edges of the chourico begin to brown or even blacken a little. Remove from heat, immediately add the french fries, pimenta salgada and hot pepper rings (to taste) and toss together well. Overfill the buttered and toasted rolls with the chourico, french fries and pepper mixture and serve plated with the extra french fries. Offer the Tabasco Sauce or the Piri-piri as condiments. Couple these with giant mugs of extra-cold beer and make some friends!